Discussion in 'Gamerz' started by Desmond David, Mar 20, 2019. This thread is created to track relevent news and announcements related to the ongoing GDC 2019 event. Yesterday Google announced Stadia, a cloud gaming platform where all your games will run on Google's cloud computing environment and streamed directly to any supporting device. Reply all GDC related news in this thread. So playing games by streaming on browser? Ok. So no need for powerful PC's in the future if you are gamer? I guess we will have to wait till Google launches it in India, and also till affordable fiber optic plans are the norm. Yeah, I think it will work best on Google Fibre. Though how much staying power this has will depend on pricing, availability and experience. Though it is a pretty neat idea and seems way ahead of what Amazon is trying to do, despite the fact that Amazon announced theirs first. Also, you don't even need a powerful PC, it runs even on a cellphone. This will be come serious competition to Steam and other store fronts. Not to mention serious competition for consoles. There are plenty of reasons why Stadia won't be a big competition to steam. Apart from the dependency on Google's servers and a good low latency Internet, there is also the factor of it being "Google". There are many Google skeptical who wouldn't want to move to "Google games". Also there will always be market for good single player and offline experience. Most casual gamers would be fine with this but this isnt for someone who would invest a lot into gaming hardware. Connection issues or input lag is a valid point but they are already releasing in countries who have superior internet infrastructure so even if there's a initial hiccup I am sure it all will be fixed soon. The places they are releasing does have huge market too. I am also sure they will bring in those mega pro gamers to promote and the option of "Join Now" is enticing. Also, I do get a feeling that subscribing to game streaming will have some perks over playing on hardware, say the upcoming XBOXes might have some limitations in terms of hardware or online feature and people need to subscribe to xCloud to get "everything". Also, no "hacks" or mods possible. Death Stranding, EPIC make it happen. Google has now entered one more segment within the internet-based services segment with an online gaming platform called Stadia. It must be clarified that it is not a new gaming console or hardware that has been launched by Google. This is purely cloud-based, and customers need to simply click on a “Play Now” button. There will be provisions for sound and Google Assistant that will be deployed to good effect. Though the announcement has been made now, Stadia may go live only in the third or fourth quarter of this year. To begin with, devices operating on the Chrome OS like Chromebooks and Google Chrome browser will have this feature on their devices. It may be made universal later about which no clarity exists now. Another factor to be clarified from the company is if this will be a paid subscription or free to play gaming platform. It has however been made clear that users in only limited geographies may get to enjoy this gaming service. These include the US, Canada, the UK and some European countries. The company held a demo showing two games, “Assassin’s Creed Odyssey” and “Doom Eternal” being played. This was at a Game Developers’ Conference in San Francisco. The details of the other games to be included in Stadia have not been disclosed yet. Though, as a business, Google’s Stadia will take on established players like Microsoft with the Xbox and Sony with its PlayStation, Google says its gaming platform will in no way threaten these players. One unique aspect of the model being proposed by Google for Stadia has come from acclaim. There is a provision for the player on Stadia to livestream his/her game on YouTube. This could become the revenue model too for the company, though nothing on this has been stated so far. Google says it has been working on this project for over 4 years now. With no investment required to buy a gaming console and with the ‘anytime-anywhere’ availability, Stadia may catch on with the consuming public quite rapidly. The million dollar question, can it replace the gaming pc's? 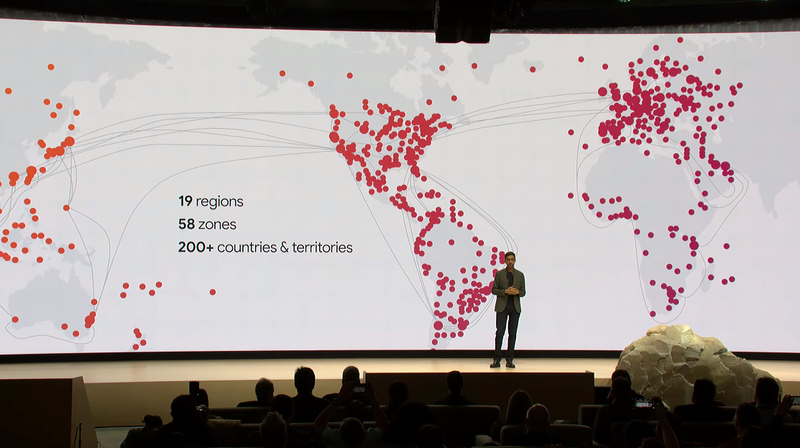 Also Sundar Pichai, an Indian, presenting a map of server locations where India is completely out of focus. Sad and logical at the same time. It's logical because, first of all, there is no Google Fibre here. Secondly, internet infrastructure will be the biggest hurdle for this here. And the stigma attached to gaming in the country.. It could get better in the future. PUBG gamers of today could become lobbyists of tomorrow.